Dinde Sare’s reputation precedes him. Traveling through Togo, Ghana, and Burkina Faso, numerous people asked us: are you going to meet Dinde Sare in Mali? 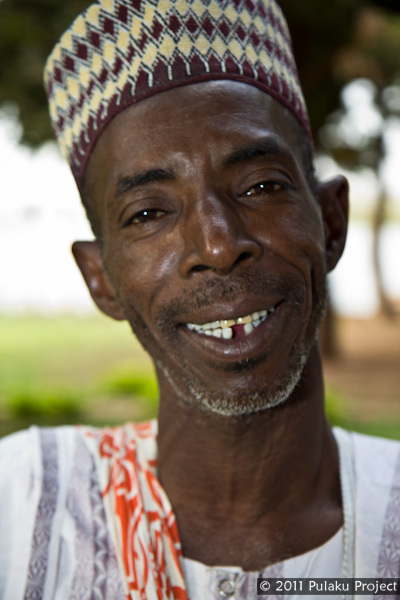 Arriving in Bamako, we called him up, and he was enthusiastic about spending a day with us. Dinde is perhaps the most famous Fulani griot. Griots are a cast of musicians and storytellers, stewards of their cultural history. As a griot, he’s called upon to perform at weddings and other celebrations. His livelihood depends on patrons who support him and invite him to play. Renowned throughout West Africa, Dinde performs at cultural events throughout the Fulani territory, from Burkina Faso to Senegal. While he’s not famous as a mainstream musician, he’s treasured by those who value the stories that he shares through his music. We spent an afternoon visiting him at the home of a patron who lodges him in Bamako. 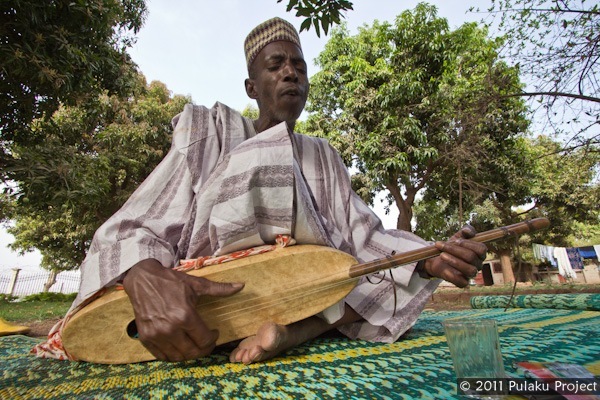 Spending hours on a mat under the shade of a mango tree, we recorded his music, heard stories about Fulani culture, and of course, drank tea. We were impressed by Dinde’s open-mindedness. Although he’s proud of his Fulani ethnicity, he sings about all the great sheikhs and leaders of the region, regardless of ethnicity. He explained that it’s his duty to document the history of all groups, because Fulani traditions are inextricably linked to those of their neighbors. Dinde released an album ten years ago, but he says the album was immediately pirated, and very few of the original copies were sold to earn him money. Although he’s already recorded a second album, he’s chosen not to release it because it’s impossible to make money off it. 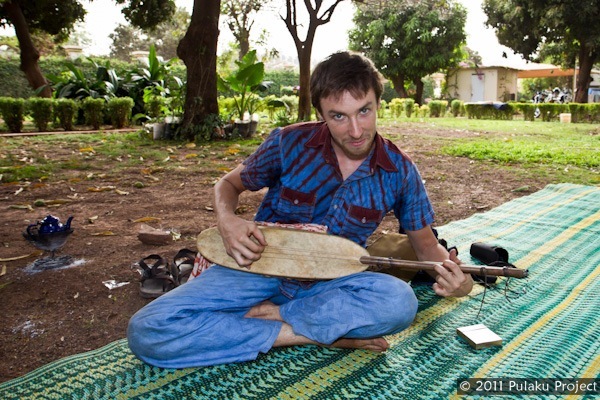 He prefers to earn his living performing live throughout Mali and neighboring countries. 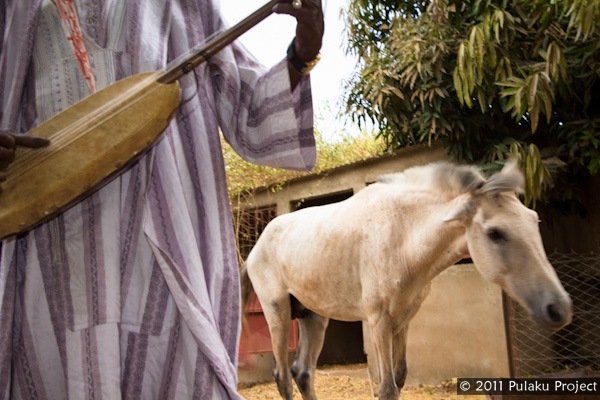 Hamdallaye means “Thanks to God” in Arabic, and it’s also the name of an historic Fulani city in Mali. Located 15km south of Mopti, the ancient city of Hamdallaye was the capital of Seikou Amadou’s Muslim empire that invaded Mali to propagate Islam. 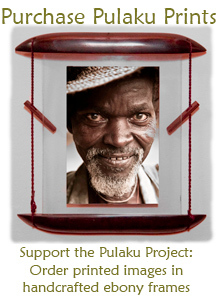 To this day, Hamdallaye remains in important focal point in Fulani culture and religion. 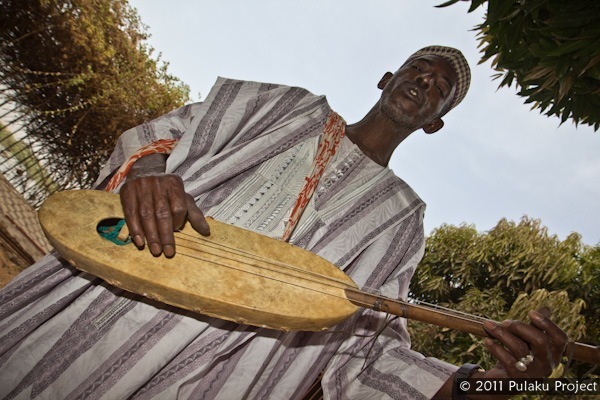 Traditionally, Fulani griots always start their performance with this song that simultaneously pays tribute to the city of Hamdallaye and a gives thanks to God. In between the two songs, Dinde introduces himself, and explains that he’s performing for the Pulaku Project. He welcomes us, and warms himself to the audience. The second portion, “Njaru”, contrasts with the first: it’s a testament to Fulani bravery, describing the feats of Boubou Ardo Gallo, a great prince who resisted Seikou Amadou’s Islamic invasion, but eventually fell. Both of these songs were originally sung by the Djelgoobe clan whom we visited in northern Burkina Faso. However, today they have become popular throughout the Fulani territory, and they are sung by griots throughout West Africa. Christoph discovered that it would indeed take a lifetime to become a griot. Wuru kamerun a lara de kuuƴe fulɓe nani ba minnda safga adamawwa gawundere be garwa belwel ! Nijeriya jogi fulɓe haa ɓuri semmbe jaaliingo fulɓe adamawa joola ɓe fulɓe gommbe fulɓe sokkotooɓe ! Senegaal Maali Gine Burkina jogi fulɓe, Fulɓe fuuta jaloŋ, ! 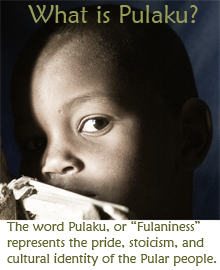 fulɓe fuuta tooro,! Ɓe fulɓe maasinaa, Ɓe fulɓe Ñooro! I was hoping to get access to the Griot Extraordinaire video clip for a classroom activity. It says it is private?? I might be interested in licensing one or 2 of your images for a project – please email me if you’re interested. Thanks.